JOHOR, MALAYSIA, Feb 15, 2019 - (ACN Newswire) - Pelabuhan Tanjung Pelepas Sdn Bhd (PTP), a member of MMC Group (BM:MMC), has sealed an agreement with Ramco Systems to upgrade the port's current Enterprise Resource Planning (ERP) system. The upgrade is part of PTP's continuous efforts in empowering its digital strategy and enhancing its operational efficiency. In addition, it is also to supplement the port's growing customer demand and requirement of the industry. 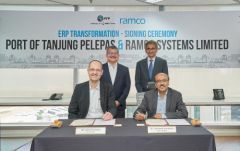 Marco Neelsen, Chief Executive Officer of PTP, remarked that the latest digital roadmap is testament to PTP's commitment in providing best-in-class service for its customers. "Given the pace at which technological advancements are changing the world, it is imperative for PTP to remain competitive and attractive. By investing in the latest technology, we are establishing our terminal as one of the best equipped and most technologically advanced terminal ports in the region".